Worried about mold, moisture damage or indoor air quality? Mold Testing Services offers 15 years of experience of indoor air quality management for more than 2000 buildings, including homes, offices, apartments, schools and medical facilities. Small amounts of visible mold found by a home inspector can be enough to stop a sale. In many cases, minor mold can be readily handled. The main concern with mold is AIRBORNE exposure. Airborne mold is not visible to the naked eye. Poor clean-ups may disturb mold, causing very high airborne mold levels, and spreading the mold throughout a building. Mold assessments without airborne mold testing must be considered incomplete. 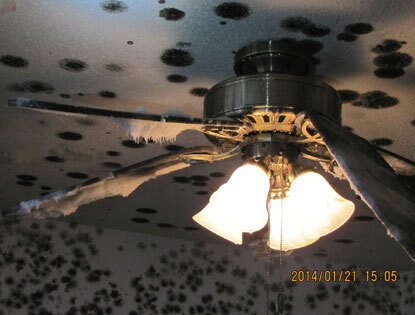 Of course, where extensive visible mold is obvious, there may not always be a need for testing. MTS has worked on many buildings where no visible mold was obvious yet very high airborne mold levels were present. This especially includes vacant and remodeled buildings and recent water or mold clean-ups. We offer both field assessments and laboratory analysis. We have worked closely with cleaning firms at many sites providing before clean-up testing (to determine the problem extent) and after clean-up verification to document mold concerns no longer exist. We are often requested to perform pre-purchase checks by realtors and homebuyers. MTS is a certified microbial investigator (CMI – ACAC certified). We have presented papers at the National IAQA conferences. We can check for moisture damage using a variety of field meters and an infrared camera. This includes roof leaks, ice dams, wet basements, Dry-Vit siding, etc. In many cases, we can perform moisture assessments with a minimum of damage. Indoor air quality (IAQ) has become an important concern as buildings are made increasingly tight to save energy. Poor ventilation, dust, allergens, and volatile chemicals sometimes contribute to health symptoms. Bad odors can be very upsetting and be due to a variety of causes. MTS can perform IAQ assessments. The MTS service area includes eastern South Dakota and Sioux Falls and communities in NE Nebraska, SW Minnesota and NW Iowa. We offer quick service and can often provide initial mold test results within 2-3 days after testing. We offer reasonable rates and a variety of options where finances may be limited. We can assist a renter or a large business. Please refer to our SERVICES page. To learn more about mold problems and solutions, see our LEARN MORE section. Let MTS help you find peace of mind! We offer free cost estimates.